Let me set the scenario for all you folks watching at home. 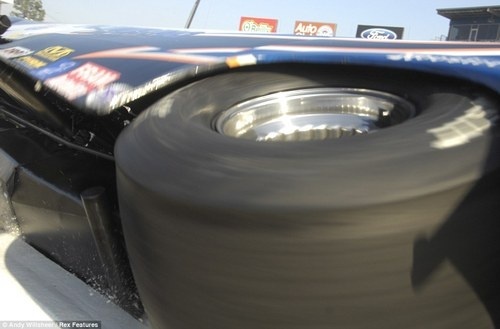 We all know racing cars is dangerous, but there are things that can be done to prevent injuries. 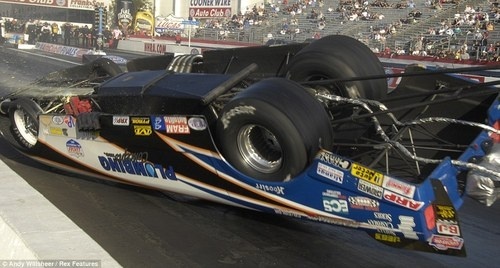 Let’s say you’re a photographer (or anyone for that matter) and a 250-mph drag car comes hurdling at you, clearly out of control. If you have any respect for life, you probably run or at least start moving away from the wreck that is sure to injure you badly if you are caught in it. Seems logical enough, right? Well don’t tell Andy Wilsheer that. Wilsheer takes his job way more seriously than his life apparently. 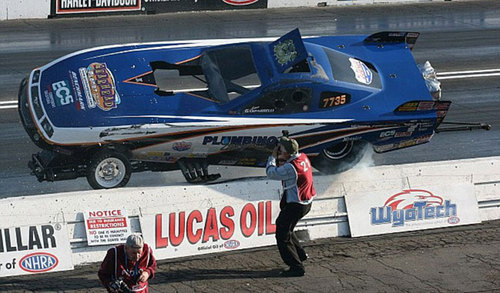 During a drag race last month at Pomona Raceway in California, Steve Gasparrelli’s Ford Mustang spun off right at the start of the race and immediately began crashing towards a row of photographers protected only by a small temporary barrier. Most of the photographers scurried out of the way, fearful for their lives. Andy Wilsheer did not, and while his courage was boneheaded at best and near-fatal at worst, it did allow him to obtain some amazing photos and also the respect of people everywhere for his gutsy performance. I wish this guy had been there when that million dollar car wrecked in Hong Kong, then we might have had some better shots of it. Now am I saying its good he did this because the photos are that amazing? No, but still you have to respect someone so passionate about their work that they are willing to risk life and limb to accomplish it. But seriously Andy, just get out of the way next time, okay?